Turkish Minister of Transport, Binali Yildirim, made an arresting arrival at the first Turkish Shipping Summit in Istanbul sweeping up the Bosporus to the waterfront of the Ciragan Palace Kempinski Hotel by boat. More than 260 delegates and a strong contingent of Turkish media were on hand to hear Yildirim analyse the government"s transportation priorities at the opening of the Summit, jointly organized by TradeWinds and Seatrade. The packed auditorium heard the minister reveal that Turkey"s shipbuilding industry is already injecting $1bn in earnings to the country. 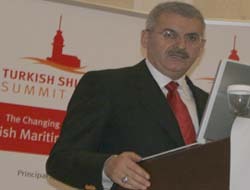 In 2003, Yildirim said, Turkey had 37 shipyards operational, mainly in Istanbul. Today more than 76 yards are in business and a further 59 are under construction he said. Chairman of the Turkish Chamber of Shipping, Metin Kalkavan noted that currently the vessels on order by Turkish owners are nearly double the existing fleet. He said that 656 ships are on order at Turkish yards, while orders placed abroad have more than doubled in the last few months, reaching 208 vessels worth over $8bn.